The shopfront almost seemed to skinny for the name of this cafe. Just around the corner from Balham tube station, on Chestnut Grove is a new (old) café, Full Fat. 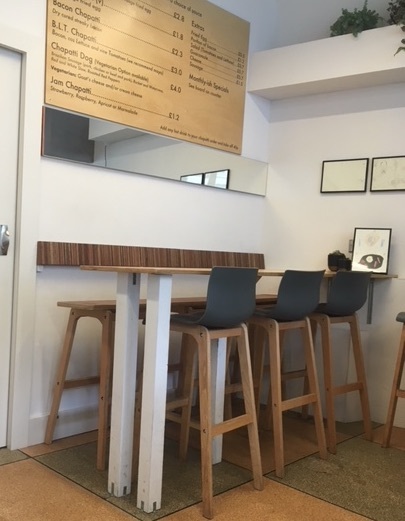 Although it has only been in its current location since September 2018, it was previously known as the Balham Kitchen and was apparently quite popular, not just because it was a friendly local café, but also because of the coffee and the chapatis. We had chanced upon Full Fat while in Balham and took the opportunity for a chapati brunch. During our coffee break several customers came in and had a chat with the two people behind the counter. With coffee roasted by Workshop and an excellent range of homemade chapatis, along with friendly people, what is not to like? We enjoyed an Americano and an oat milk hot chocolate together with two chapatis. My egg chapati was perfectly done, just the right amount of pepper-to-egg balance. And the coffee was also very well made with plenty to think about just by gazing into it. Although the café itself is quite small, there are three tables and several seats, enough to be able to ensure that you can probably perch somewhere to enjoy your coffee and chapati. 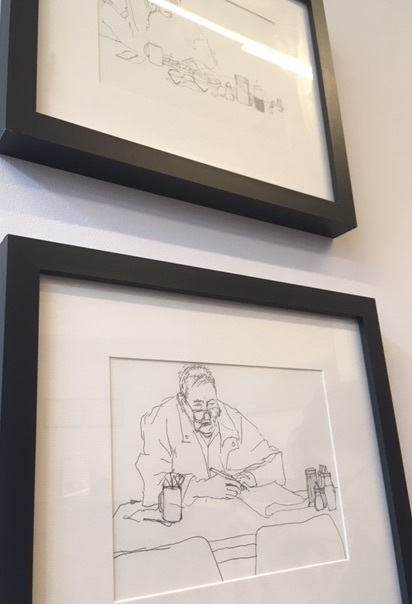 There are even entertaining drawings on the walls of the café that make me wonder whether these are previous customers, immortalised on the walls enjoying a cup of coffee with their morning paper? Certainly they are a good reason to put down your smart phone and just soak in the atmosphere here. Apart from the drawings, the other decoration in the café that caught my attention was behind another table: a striped piece of woodwork that was reminiscent of a type of cake served in Malaysia and Singapore, kueh lapis. It is a layered cake, the idea being that you peel each layer off to eat it, extending the enjoyment that you can get out of a cake. Although the layers peel easily, ordinarily the cake holds together as a cake, the layers do not glide over each other as if they are wholly separate, perhaps like chapatis stacked on top of each other. No, whether the cake works or not, as a kueh lapis, is down not just to the flavour, but also to the texture and to the way that each layer peels from the next, the subtle tug of one layer held, but not quite, by the last. These interlayer or interface effects are often, ultimately, an atomic phenomenon. Just as when you drop a drip of coffee on the table, the thing that ultimately determines the shape of the droplet is the attraction between the molecules in the water and the atoms on the table surface*, so the stickiness of the cake has to be occurring, ultimately, at the atomic level. Interface effects can be crucial in other solids too, not just coffee and cake. Consider sapphire. Sapphire has the molecular formula Al2O3. Ordinarily it is colourless and transparent, it becomes blue when impurities are added to it. But sapphire has another property which is that it is electrically insulating: a sapphire would not conduct any electricity if you tried to use it to connect to your light bulbs. This insulating behaviour is shared with another oxide, strontium titanate, SrTiO3, which is also a colourless and transparent material. Nothing of any interest there then. But, and this is the key thing, if you took a piece of strontium titanate and grew the sapphire on top of it, under certain growth conditions, this bilayer becomes extraordinarily electrically conducting, far better than many metals that you can think of. And it is because of the atomic effects that occur at the interface between the strontium titanate and the Al2O3. Can you see the layering on the wooden panel behind the table? Thought not, you’ll just have to visit Full Fat and see for yourself. But then another example, a new finding that is perhaps more closely associated with coffee. When you take the semiconductor molybdenum ditelluride (MoTe2) and sandwich a thin layer of it between two sheets of graphene, some atomic-level interactions occur. In the case of MoTe2, the “band gap” of the semiconductor (which determines how it conducts electricity when light is shone on it) is altered by the van der Waals forces associated with the graphene layers: the interface effects are changing the way that the semiconductor reacts to light. Ordinarily if you shine a pulsed laser at such a semiconductor, the electrons† that get excited across the band gap are few enough that they behave as a gas within the semiconductor. This means that if you add more electrons (by pulsing the light on the semiconductor again), the density of the electron ‘gas’ will increase. What researchers have just shown is that for this 2D layer, if you shine very high powered lasers at the MoTe2 layer for a short length of time, so many electrons get excited that the semiconductor no longer behaves as if it contains an electron gas, but an electron ‘liquid’. A sort of droplet of electrons in the locality of the laser beam. And because of the way that the band structure had been affected by the interface layers, they managed to obtain this behaviour at room temperature. Although such liquids had been created before, the new thing about this result was that previously these experiments were usually done at very low (-269C) temperatures. Quite a temperature increase on previous results! Droplets of an electron-hole excitation may seem a far step from the droplets of coffee that you could be enjoying at Full Fat. However, it is just a short hop for the imagination if you stopped to give it time to think. What will you notice next time you are in a café? 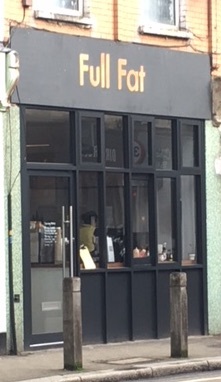 Full Fat is on Chestnut Grove, literally just around the corner from Balham tube station. *Assuming that the table is flat. If the table is nanostructured, the structure itself can influence the ‘wettability’ of the table.